1. When something irritates you, tell your AS or HFA youngster what you are feeling so he can learn to recognize emotions in others and label them in himself. Then talk (out loud) yourself through the frustration so that your youngster can hear your “positive spin” on the situation (e.g., “This is really not a big deal” … “I need to calm down” … “Relax and take a few deep breaths” … “It’s okay, I can deal with this”). 2. Any time you encounter frustration while in the presence of your AS or HFA youngster, imagine that she will replicate your exact behavior every single time she is frustrated for the rest of her life—so proceed carefully! Take care not to raise your voice too loudly, or be disrespectful to others. If you do any of these things, make sure to tell your youngster that you made a mistake behaving in that way and need to make a better choice next time. 3. Make sure that your youngster is given a few opportunities to play with other kids in situations where close adult supervision is not required. Parents should be responsible for ensuring their child’s safety, but other than that, try to let your child and his peers work out problems among themselves. When kids play independently, they learn how to deal with frustration in ways other than letting grown-ups solve their problems. 4. 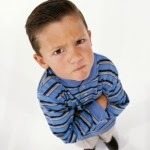 Do not accidently teach your AS or HFA youngster that expressing frustration inappropriately (e.g., screaming or hitting) is a good way to get your attention, even if it is negative attention. Ignore these behaviors if they're not causing serious harm, and give lots of positive attention for times when your youngster handles a potentially frustrating situation in a healthy manner, and point out specifically what he did effectively. 5. When you see your youngster become frustrated, try not to mirror that frustration in your own voice or behaviors. Instead, focus on staying calm and talking your youngster through the situation in a gentle voice, guiding him to mirror you. Acknowledge that he is frustrated, but stress the importance of continuing to try to do something that he may find difficult. 6. Give ample attention to acceptable behaviors so that your AS or HFA youngster learns about positive consequences as well. Use a behavior chart as a visual aid to assist her in developing awareness regarding how she handles her frustrations. Place a sticker, happy face or star onto the chart whenever she remembers to manage her reactions in a positive way. Keep track of how many stickers she has accumulated, and reward her with a special activity once she reaches a predetermined goal. 7. Keep your youngster’s world as predictable and routine as possible. If AS and HFA kids feel confident and secure in general, they will be able to handle minor setbacks and frustrations. 9. Use your youngster’s teacher as a resource. Ask for suggestions about how the school deals with frustration in students in general, as well as for specific tips about helping your youngster. The more that you can be consistent with what the school is doing, the easier it will be for your youngster to internalize the lessons that you and the teacher are trying to teach. 10. Help your youngster learn the important skill of “delayed gratification.” AS and HFA kids do not yet have the brain development or experience to effectively cope when they have to wait for what they want, so parents have to give them practice developing this skill. As much as possible, have your child wait for what she wants, even if it's just for a minute or two. Talk to her about how to distract herself while she is waiting for something. 11. Every evening, review the day with your youngster to discuss how she handled various situations throughout the day. Always bring attention to the positive behaviors she displayed during the day. Reiterate the consequences that occurred in different scenarios to help her understand how her behavior affected both herself and others. 12. If your son or daughter is an adolescent, remember that all adolescents struggle with testing limits, learning to make their own decisions, and learning to function independently. All adolescents struggle with making and keeping friends, with finding success at school, and even with the development of romantic relationships. Your AS or HFA teen may be more frustrated than a “typical” teen, but he may not have the skills to handle those frustrations. So, set appropriate limits while trying to give your teenager some leeway to function independently. An AS or HFA youngster can grow frustrated when an obstacle arises in his effort to achieve a goal. However, frustration can prove a valuable emotion; it can motivate the youngster to surmount the obstacle with an extra spurt of determination and initiative. Parents can use the techniques listed above to help their “special needs” children deal effectively with day-to-day frustrations.